Nasopharyngeal cicatrix syndrome (NCS) is becoming a more common diagnosis impacting the upper airway and respiratory patterns in many horses. The condition has been around for quite some time, but is becoming more recognized as a possible cause of respiratory difficulty in certain horses. The exact cause is unknown and treatment options commonly utilized target inflammation. However, despite these treatment options, many horses continue to progress and worsen over time. In this article, we highlight one horse in particular and note stabilization of the condition through the use of diet and herbal therapy, requiring no medications. Nasopharyngeal cicatrix syndrome is an inflammatory condition that impacts the upper airway or pharyngeal region of the horse. It has been most commonly found in horses located in Florida and Texas primarily, but has been recognized in other geographic locations. A cicatrix by definition is a scar associated with a wound, granulation tissue to an extent. As with any wound, the scar tissue or cicatrix is a different type of tissue, not being as elastic or mobile as the original tissue. In the case of NCS, there is evident inflammation, creating small wounds of sorts, damage to the nasopharyngeal region in the horse. Over time, due to the inflammatory damage, scar tissue develops in the form of a cicatrix, which can limit normal airway function. This is commonly seen on endoscopic examinations as white plaques or streaks noted on the walls of the pharynx. In the image to the right, the white plaques are noted by the arrows. Given these findings, it raises the question as to whether an allergen plays a role in nasopharyngeal cicatrix development. Could the inflammation be secondary to an allergy? The immune response is directly associated with both inflammation and allergic responses. In most allergies, the immune response is hyper-reactive, responding to various allergens in the air or environment, and then triggering an inflammatory response. In research, including our own, it has also been noted that in many allergic conditions, there is a connection back with gastrointestinal health, considering that the GI tract is ‘home-base’ for the immune system. In many, but not all, cases of nasopharyngeal cicatrix, it can also be noted that the patients are easy-keepers, being heavier in weight. Many easy-keepers tend to have underlying GI dysfunction, which makes them more prone to allergic conditions ranging from the skin to the eyes and the respiratory tract. Could these nasopharyngeal cases simply be a result of a dysfunctional immune response, typical of an allergic response, tied back to underlying gastrointestinal dysfunction? Could we treat them as an allergy and gain positive ground through the use of dietary and herbal therapy? Mr. T is a 18 y.o Quarter Horse cross gelding that was presented to a local university for evaluation of difficulty breathing at times with odd noises coming from the airway. His physical examination was normal, but he was a heavier breed horse noted to gain weight easily. He also had some ongoing foot problems, including thrush, and seemed to be more prone to skin allergies and bug bites. Mr. T was also on a commercial feed and noted to be a picky eater by his owner. He was diagnosed with mild nasopharyngeal cicatrix syndrome (NCS) by endoscopic exam and there were noted mild white scars or cicatrix formation on either side of the pharyngeal region. Mr. T was placed on oral and injectable corticosteroids for symptomatic therapy to aid in reducing inflammation, but the overall prognosis was guarded due to many cases progressing. His owner pursued the typical therapy, but the response was not positive and he continued to demonstrate clinical problems. During a consultation, we reviewed the theory and causative factors behind NCS, including inflammation, immune dysfunction and the connection with gastrointestinal function. In reality, NCS is not much different than a horse with COPD, IAD or other inflammatory-allergic type of condition. Mr. T was moved to a whole grain, whole-food diet including oats and alfalfa pellets and removed from his commercial feed. He was placed on the Cur-OST EQ Total Support formula to aid in managing inflammation and specifically targeting the gastrointestinal tract with healing support. The Cur-OST EQ Immune formula was also added as a part of the recommended regimen to aid in modulating the immune response and to further benefit the gastrointestinal tract health. 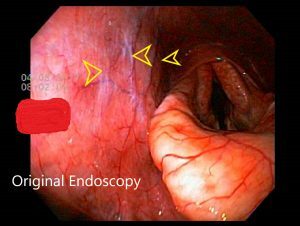 In his original endoscopic image, the cicatrix lesions are rather mild and small, but still prevalent and noted by the arrows. There is marked inflammation or redness noted in the laryngeal and pharyngeal region as well, with upper airway compromise noted and a thickened epiglottis. In his follow up endoscopic image, 4 months later, the lesions are still present, but not they have not progressed in size, shape, or number. The overall state of inflammation in the airway appears to be reduced additionally. At the time of the endoscopic exam, Mr. T appears to be doing well clinically with no progression of his lesions. 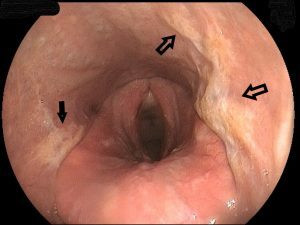 This is not normally something that is encountered in most nasopharyngeal cicatrix cases, as many continue to progress over time despite medical therapy. The traditional approach to management of nasopharyngeal cicatrix in the horse is through the use of corticosteroids and other allergy type of medications, including antihistamines. In some cases, due to presence of a secondary infection, antibiotics are utilized. The overall success rate with NCS cases can be poor in some cases, despite these therapies, and progression is often expected and can be rapid. The underlying problem with nasopharyngeal cicatrix is inflammation, suspected to be to allergens in the air or environment. This is noted by the increased incidence in horses on pasture and also due to a higher degree of prevalence in the warmer months. These factors all make a connection with allergies being the main underlying factor. The traditional approach to managing allergies in the horse is often very similar, utilizing corticosteroids, antihistamines and allergy injections. Here again, though, the long-term response is poor and the allergies tend to get worse year to year. From an alternative medicine and herbal viewpoint, our goal is to manage the inflammatory response, but also modulate or balance the immune response. This can be accomplished with the use of herbs along with dietary modification. The diet is modified to lean towards one that is higher in all natural foods, not commercially processed diets. The goal through dietary changes is to reduce possible stimulation or contribution by processed feeds on the immune response and GI health, and to aid in natural nutrient provision for cellular support. Gastrointestinal health and microfloral imbalance plays a major role in many equine health conditions. Through taking this approach, balance can be restored in the body and results can be achieved. Medications can be utilized along with herbal and dietary therapy, if needed, but they only address the clinical signs that are present, not the underlying pathology that is within the patient. Only through dietary and proper herbal therapy can the underlying condition be targeted and moved towards balance. In this case, Mr. T demonstrated marked clinical response to the herbal and dietary therapy. We do not expect complete resolution to the cicatrix lesions, as they are scar tissue formation. They may reduce over time, but the overall goal is to balance the response and minimize further progression. My horse is positive for Pythium and has the scarring shown in you pic upper right. W/o going into too much detail I have become somewhat knowledgeable on this topic. Way before this ever came into my life all grain had been stopped, ceased many vaccines, hay tested and have followed a more Dr. Kellon approach to diet. I will have my 20 yr. old gelding re scoped in a few months. When 1st diagnosed I used one of your products-so I am aware of the ingredients and totally believe in this approach. Can you give me an approx. cost for both products for one year? I am trying to look longer term (and have hope) as we are headed into high allergy season here in Texas. Hi. Thank you for your comment. The two products we currently using in these cases are the Cur-OST EQ Total Support and the Cur-OST EQ Immune. You can click on these links and see pricing on the Nouvelle website. Thank you! I have two horses that have been diagnosed with NCS; I am in San Antonio. One is an easy keeper, yes, but the other is my 3 YO Oldenburg gelding, whom has always been on the lean side. He was just formally diagnosed last week, and the vet put him on a step-down course of dexamethasone. Right now, he is still out on pasture full-time, but I am going to board him at a local stable that has dry-lot turnout for a month to see what impact that has. My question is, I can certainly switch his food from his current processed food to the oats and alfalfa pellets, but what other natural product would you recommend since he is not an easy keeper? Thank you for your article – I’m not excited about the possibility of having to keep my horses pumped full of steroids to keep them comfortable and am hoping your more natural approach will aid in management.